Harry Edelson was one of the greatest athlete-coaches ever produced in the Los Angeles area. 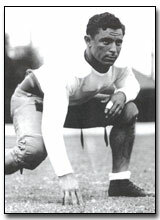 During his three varsity football seasons at halfback for the University of Southern California, the Trojans were 27-3-2. In his final collegiate game, a 47-14 rout of Pittsburgh in the 1930 Rose Bowl, Edelson tallied two touchdowns- on 55-yard and 39-yard passes (from Russ Saunders). Upon leaving USC, Edelson returned to his Jefferson High School alma mater to coach track and field. Jefferson High won Los Angeles Track & Field Championships in 1931, 1935, and 1937-41; winning the California State title in 1937. As head football coach at Fremont High School, Edelson’s teams won five L.A. City Championships-1945, 1946 and 1948-1950. During those five winning seasons, Fremont posted a 39-2-2 record. At Los Angeles High School, his Romans went to the L.A. City finals three times-1952, 1954, 1960. Edelson also officiated high school and college level football, and served as supervisor of officials for the Pacific Coast and Pac-10 Conferences. Harry was born in Jaffa, and immigrated to Los Angeles in 1920.